As we finish the second to the last month of this year with Gladys Taber and Rachel Peden, I thought it would be nice to offer some photos of, and links to, the women themselves. I'll begin with a short video in which we see Rachel's landscape and the concerns about preserving it. Toward the end her son, Joe speaks. Though this is very small, I loved seeing her with books on the shelf and her typewriter in front of her. 1972, only three years before she died. Rachel Peden lived from 1901 to 1975. She graduated from Indiana University in 1923. She and her husband Richard lived on the family farm on Maple Grove Road, where they held open houses for children to see daily farm life. For 30 years she wrote a column, "The Hoosier Farm Wife Says..." for the Indianapolis Star under the byline Mrs. R.F.D. 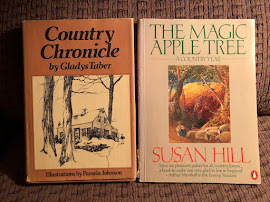 She wrote three books, Rural Free, a farmwife's almanac of country living; Speak to the Earth: Pages from a Farmwife's Journal; and The Land, The People, about the family farm. The child in this picture is her young granddaughter, also named Rachel, who is Past President of the Monroe County Historical Society, and Monroe County Historian. I so wish I could have gone to this at which the granddaughter pictured above, Rachel Peden McCarty spoke just this month. I was delighted when she left a comment here on the blog once. There is a little bit about her here. There is a nice piece here. And this was just great to read! Here is a PDF, but it is the best of all the sites I've come upon. You can increase the size to see it better. Over the years I've posted a few photos of Gladys which you may find if you click on 'Gladys Taber' under 'Letter Topics.' These two were new to me. Not sure of the year, but isn't she young and oh, so beautiful! 1955. Gladys and her daughter, Connie, and the Cocker Spaniel, Especially Me aka Teddy. I love that dress. When did women stop wearing such dresses? I miss women who look like this. I found a cool little slideshow of Stillmeadow, her Connecticut home. 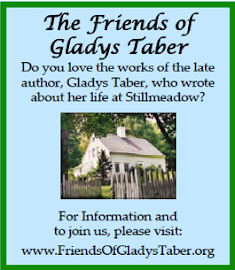 There is a website for The Friends of Gladys Taber, of which I am a member. There is a lot of biographical information, and a list of all her books here. And if you do a search for her name, you will find many results in the blogging world. And now on to their Aprils. Surely never was spring so wonderful, such a miracle! Isn't this what we all think every time it rolls around?! And this year I thought to myself that every spring I have to relearn the language of the birds, those I haven't heard for months and months. I'd hear a song, and have a moment's hesitation before I recognized it. Oh yes, that's the Song Sparrow. And could that be the Wood Thrush? The early flowers have a special beauty - I always shake with excitement when I find the first clump of snowdrops, fragile, pearl-pure, bending their heads lightly toward the icy dark ground. Crocus makes rainbow patches all over the yard; scilla like bits of the sky snipped out and scattered down. 'Shake with excitement!' Don't you love that? I hope each of you also experienced such joy in your springs. She writes about her friend George plowing the fields. I think a man who plows rides the world. You can feel the great old Mother Earth being released from winter rigidity, and giving again her richness to mankind. You feel the mystery of growth which so far man has not destroyed. Plant well, says the soil, and I will nourish you once again. My favorite view near New Milford is destined to go when that gracious and green valley is flooded by the power company. ... It gives one to think. For nothing is secure. Bred in the tradition that a man's home is his castle, we now know that is not so at all. At any door, a tall man may knock, with a paper to sign. Or a great gas main can be laid right through a special cherished garden. We see the denuded forest every time we go to the village, and only a big orangey pump affair protrudes above the ragged earth. Eventually somebody has got to decide how to protect the rural agricultural areas. For the big cities need tons of milk and it takes pastures and cows for milk. You can never pump it out of a faucet. Thanksgiving tables need fat crispy turkeys and that means turkey farms. As the city developments move out, the farm land diminishes. Here in New England, it will be a problem, maybe in my time, certainly not long after. The balance must be maintained, particularly in this part of the country where distances are small and so easily swallowed up. And then, here she is, ever forward thinking, on the local food movement. The great Midwest can feed us all, I expect, but then the problem of transportation enters in. How many freight cars, how many refrigerated trucks needed to carry vegetables and fruits enough - and meat - and eggs - ... I think it is more feasible in the long run for the egg woman to deliver two dozen fresh eggs a week from the next road over, than to ship eggs from Kalamazoo, Michigan. Economics is too complex for me. But I have instincts about supply and demand which I believe in. And I shall always feel a carrot next door is better than a carrot from Ames, Iowa, all things being equal. kept accurate records of grass mixtures used on each field and therefore knows what proportion does best in each. He said: "It's my ambition to have the water clear enough to drink when it runs off this farm. A two-inch rain will run off muddy, and muddy water will carry away three tons of topsoil to the acre. That's as much as a small farmer can build up in a year's good management." Here Rachel, too is forward thinking and ahead of her time. There is a particular blessing to be had from walking in a woods or a field from which no other harvest is exacted except that blessing. As the population of the world steadily increases and land is nibbled away for public uses, the human hunger for mere space becomes continually more insistent. Oh, April, how gay, how welcome you are! You go out to the field, and if you're not watching right then, you'll miss the cue. When she sees you coming, she'll look right straight to where the calf's hid, because the thought of the calf pops into her head before the thought of deception. Such are the things we notice when we live with animals whether they be cows or sheep or dogs. And our lives are richer for the knowledge we attain. There is poetry in Rachel's description of clothes on the line. Sheets on the clothesline this morning flap in mighty applause. The sound comes in distinctly through the house walls; and, when they flap, reflected sunlight rolls and leaps from the sheets like crumbs being shaken from a Sunday dinner's tablecloth. Joe, who was in the above video, expresses what most of us wrestle with all through life. "Sometimes," remarked the seventeen-year-old son, "I wish I had a broken leg or something, so I could just walk slowly up to the woods - just take my time and see everything, the leaves, the bugs, everything. And enjoy myself." "Well, goodness," exclaimed I, "you can do that anyway, without having a broken leg!" "No," he insisted sadly, "if you're all right, you have to be working. You're always in a hurry to get some place else. You don't have time to go slow and enjoy yourself." Well, as I noted, next month is the end of our visits with these two wonderful women. I find myself feeling sad, and already thinking about ways to continue in some way. 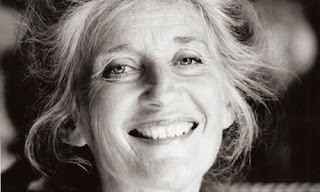 I think that Phyllida Law is the most beautiful woman I've ever seen. And some of that beauty comes from an ever-present twinkle in those blue eyes. In this book, the twinkle comes through in her words as well. Phyllida Law's mother-in-law lived with her and her husband, Eric Thompson and their two daughters, Emma and Sophie, for seventeen years. Because she was deaf, what Gran called in that terrific Cockney rhyming slang - 'Mutt and Jeff,' Phyllida wrote notes to her. … aware at last that she was becoming increasingly isolated, I began to write out the day's gossip at the kitchen table, putting my notes by her bed before I went to mine. One night my husband wandered off to his, muttering darkly that I spent so much time each evening writing to Gran that I could have written a book - 'And illustrated it!' he shouted from the stairs. And what a gem it is. It is funny and warm and paints a picture of English life in the late sixties and early seventies. We go to the shops, we meet the neighbors, we hear of the ailments, and learn the family stories. And we see the particularly funny way that the author looks at the world, and laughs at herself. It seems there is a new deaf-aid on the market. I keep seeing it. It's like an Alice band so you wear it on your head with these wee muff things that sit on your ears. Very practical. You'd be surprised how many young people are wearing them. You are not alone. I shall do a bit of research and report back, because I think they might be the very thing. … I told Dad [her husband] about the new deaf-aid on the market and he tells me it's a thing called a Walkman which plays music into your ears. He and the girls were hysterical. Trust me to get it wrong! She says Syd has a very sweet tooth. He gave her 50p to go to Alexis for a piece of cheesecake and two Bath buns for his lunch. Well, my dear, she only got a small piece of cheesecake for the money. 'Where are the buns?' cried Syd. 'He lives in the past,' says Mrs V.
is about how one floats in salty water. I couldn't get my bottom under the water. Dad [her husband] said it looked as if I was being followed by a baby elephant. Or a small island. When Gran has her final illness at the end, you would never know there was any serious trouble from the cheery, normal, one-sided conversation Phyllida keeps up in her notes. Great excitement at home. Your room looks gorgeous already. 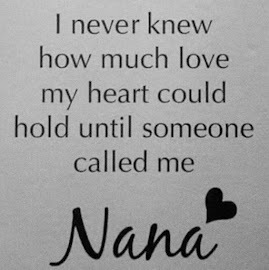 There is a dear afterward by both granddaughters about their beloved Gran. In the course of this book, we learn that Phyllida Law is as beautiful inside as outside. Her kindness, her wit, her joy in living comes through in each word she writes to her mother-in-law. This is just so wonderful. I had a smile on my face for the entire book. When I finished The Invisible Ones this afternoon, I said right out loud, 'oh, wonderful.' I've never read anything like it, and as is my wont I'm not going to give very much away in my book report. What is it about? A private investigator is asked to discover the truth about a man's daughter who went missing several years ago. Why wait till now to check into her disappearance? Because his wife has died and he feels that their daughter should know. And he suspects the girl's husband and his family have 'done away with her.' Mr. Wood comes to Ray Lovell because he is 'one of us' - a Gypsy. JJ is fourteen and a member of the family that Rose Wood married into. He and Ray Lovell each have a gorjio - non Gypsy - parent. They tell the story in alternating chapters which is brilliant because the reader investigates right along with Ray Lovell, but also learns insider information from JJ. Sometimes their narratives coalesce into one story. It's just so well done. As an outsider to this culture, I am very interested in the history and life of these people. I learned a bit in Jacqueline Winspear's An Incomplete Revenge, and Miss Read's Thrush Green. I own a book called A Field Full of Butterflies: Memories of a Romany Childhood by Rosemary Penfold which I really look forward to reading. In the school library I read this book [I looked it up and apparently this isn't a real book] called Down the Lane: A Threatened Way of Life. I wondered what other people thought about us. This book was written by a gorjio for other gorjios, and even though it was aimed at school kids, it seemed stupid and simple. It talked about bender tents [Brit. a shelter made by covering a framework of bent branches with canvas or tarpaulin] and wagons, and wooden flowers and horses and mending knives. It said that Gypsies have dark skin and hair, and "particularly bright eyes." What does that mean? How can some eyes be brighter than other eyes? By being wetter? I suppose some of the things it said were true. Some Gypsy men used to make wooden flowers, but it all seems long ago and not much to do with me or my family, or anyone I know. The book said that we're in touch with nature and know how to make old herbal remedies and stuff like that. Well, I don't know. Great-uncle's wife knew all about herbs and plants, apparently, but she's dead now. You get the impression that Gypsies are supposed to be wild and free. But there was nothing about O levels in there, for example. Apparently, Gypsies don't do exams. They don't become doctors. The Invisible Ones is set in the mid-1980s. The colorful horse-drawn caravans are long gone, and the cover of this book is more the reality. Trailers that can be pulled behind a car or truck are the homes of modern times. There are fewer and fewer places in Britain where they can live. Land has been paved over or consolidated. I found myself thinking how life has likely changed even more in the decades since. This book doesn't romanticize the life. There is mention of women being little more than slaves, living with abuse and few options for escape. The elders worry about assimilation and losing the purity of the blood. There is superstition, and lack of good health practices. Yet through the eyes of JJ, we see that there is acceptance of how things are. The story unfolds in such a way that I realized I was literally holding my breath a bit as I read. I couldn't imagine what was going to happen next. This isn't a thriller, but it is thrilling in a quiet, pensive way. Ray Lovell is a dear, gentle fellow who is reeling from his wife's request for a divorce. His father gave up the traveling life and became a postman. Though he doesn't know much about the life, he is trusted by the Gypsies. In his sleuthing, he has access which a gorjio would never have. I really, really loved this book. If I worked in a bookstore or library, I would be trying to convince everyone who came in to read it. You may visit the author's website. 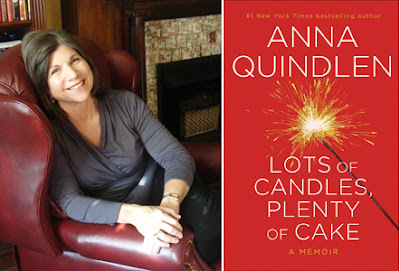 Just popping in to let you know that Anna Quindlen was interviewed by Terry Gross on Fresh Air today, and you may listen here. Two of Anna Quindlen's nonfiction 'Loud' books - not sure which since I asked the library to get all three and they emailed me to say that two have arrived. I hope to be back next Saturday, but it may not be until Monday. I'll leave you with two apt quotes. But each spring a gardening instinct, sure as the sap rising in the trees, stirs within us. We look about and decide to tame another little bit of ground. Reading is a vacation you can take everyday. I haven't written a farm and garden report for ten months. Ten months! I don't know what happened. Why didn't I write in July and August and September? There are a few postings under the 'farm and garden' label but I guess there just wasn't enough in them to call them a 'report.' I do know it was a very dry July, with rain only one day. The daylilies came and went post-haste (I've always wanted to use that in a sentence!). We did get a lot of vegetables from the garden. Unlike the ducky in the blog header, we are having a bit of a dry spell just now. There have been some grass fires in nearby towns. It is supposed to rain this weekend. These days of Tom's vacation week have been just perfect for gardening. Sunny, warmish, breezy. Last year he put in a new raised bed on the other side of the fence from the patio. It turned out to be too shady for most vegetables so this year it is to be solely for lettuce. which we started from seed under the lights a few weeks ago. Yesterday Tom planted the Siskiyou Sweet Walla Walla onion seedlings and Primor French Baby Leeks in a bed which already had two chive plants. For a couple weeks now we've been eating fresh chives, the first edible plant in our garden. Today I popped in the little Egyptian Walking Onions in that same bed. These are fascinating little perennials which you may read about here. This afternoon I'll plant the Green Arrow Peas, and that will be it until the danger of a hard frost is past on Memorial Day. Our sheep shearer Katie came yesterday. I've written a few letters about this annual event: in 2007, in 2010, and last year. She is a joy, as always, but this visit included a sad surprise. Tom had led the sheep into a large stall three hours before she came. The goats go in too because Katie trims their hooves. When she arrived and walked into that stall, one of the goats, Bracelet, lay there dead. She had been quiet for a while and not as eager to eat but still it was a shock to find her there. Tom moved her out of the stall during the shearing and buried her later. He has buried a lot of animals in the thirty-one years we've lived here. He always does the job alone with his thoughts, and may sometime share those thoughts on the blog. The daffodils, bloodroot, and panolas are in blossom. Those panolas! Do you know what they are? They are a hybrid between pansies and violas. Their faces are in between them in size, but they definitely take after the viola side of the family when it comes to spreading. Around here pansies are an annual you buy at the store, while violas or their other name, which I love, 'johnny jump-ups,' pop up literally everywhere. And the panolas are even more hardy and prolific. Tom's mother gave me some and I planted them in one of the raised beds. They practically took it over. We dug them up in the fall to make room for more vegetables in that bed, and now they have self-seeded in nearby beds and in the garden paths. I'm not complaining. They are beautiful and cheery wherever they choose to appear. I got these bulbs six years ago from that wonderful purveyor of heirloom flowers, Old House Gardens. All the other flowers are up and growing but blossoms are a ways off yet. It looks a little sorry just now but those buds promise new life this spring. For years now I've been posting pictures of the daffodils which grew in front of an old stone planter which was here when we bought the place. I bet we've tried four or five different things inside the planter over the years and nothing has worked. It made the corner crowded and so this year Tom took it down. Now the daffodils have a little space where they may spread. We have a second daffodil area just across the road, amongst some lilacs. and a clump of chives. The flowers will be gone by when the lilacs come out, and the chives grow just fine there all summer. This isn't a good photo, but it will give you an idea. I love this area. Speaking of photos, I am increasingly unhappy with mine. I have read that my particular camera, with which I was so happy at first, may take blurry pictures as time goes on. I find I'm taking fewer and fewer photographs. I am open to any and all suggestions you may offer on a small but effective camera. Though I hate to buy another one, I really do miss good, clear pictures. 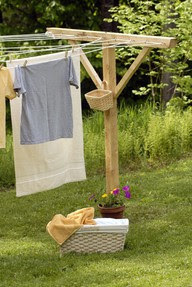 Over the years that we have lived at Windy Poplars Farm, we've had a few different clotheslines. The first was a short line from the end of the house to a pole in the ground. When I think of it now, I see little toddler clothes and our dog Lucy running underneath it. The second one was a pulley going from our old shed, now long gone, out back to the telephone pole. Then we tried lines between the maples out front, but they were too long and often blew down low to the ground in our strong winds. We tried putting one on the porch but it was too shady. And then a few years ago, we settled on the 'umbrella' type. It worked okay, but it wasn't easy to hang the big comforter cover, and I didn't like the way the lines were so close together. In terms of the spot it was in - it made the yard off the kitchen too crowded. It wasn't easy to walk in that area with daylilies on one side and the picket fence on the other. So, for a while now, I've been wanting a different kind of clothesline in a different place. I knew just what I wanted in a clothesline. So yesterday, on the first Saturday of Tom's April vacation he built a new one. We put it a little further away from the house, down next to the north pasture fence. It's a lovely little spot with an old Snow apple tree and a tumbledown stone wall nearby. I like walking out to it - past the vegetable garden, down a path between an old honeysuckle bush and a lilac. It is in a spot where the sun lingers late into the day, and I will be able to see the sunset as I take down the clothes (west is left of the clothesline). I am so very pleased. To give you an idea of the old and new locations, I took these pictures from the kitchen steps. I'll end with a poem about hanging clothes. If anyone knows who wrote it, please let me know. 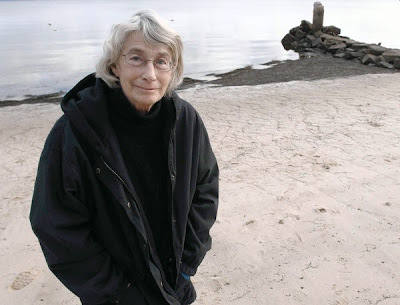 My blogging friend, Peggy Ann let me know this morning that one of my most beloved authors has died, Miss Read. She was within days of turning 99 years old. A good, long life. Just now I happen to be re-reading News From Thrush Green, the third book in her Thrush Green series. I discovered Miss Read on my library's shelf when my kids were young. 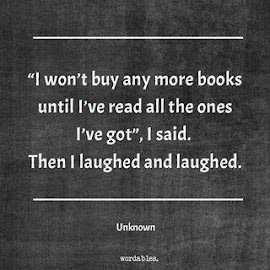 I read every book there and then got the rest through Inter Library Loan. She was the first chronicler of English village life I had ever read, and this genre, this setting became my very favorite type of book. Her two series, Fairacre and Thrush Green are so real to me that I'm sure those characters are in their little villages walking to the shops and talking over the fence to one another. "happiness is the result of an attitude of mind." 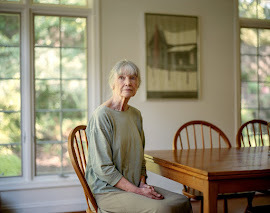 "I believe you can build it out of small things, out of hearing someone calling across a garden, a robin in a hedge, a cat in the woodshed," she once said. "When I hear depressing news on the radio, I can switch off and drift into what is, I suppose, a dream world. I think all people like to look back, not because everything was better in the past, but because often they were happy then." Her obituary from The Guardian follows. 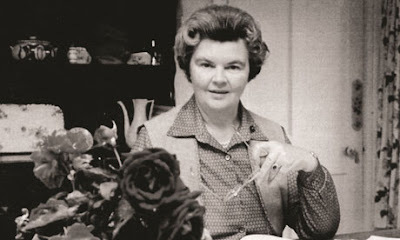 Miss Read was the bestselling author who made real the idea of the English village school as a sane and safe haven for those growing up after the second world war. The books were written under a pen name by Dora Saint, who has died aged 98. She took her pseudonym from her mother's maiden name. The fictional accounts, based on Saint's own life as a village school teacher, appeared almost annually for four decades from the mid-1950s. She was wonderfully gifted at describing, with apparent simplicity, the joys of the countryside, from discovering a robin's nest inside a hollow damson tree to smelling a field full of sage. Her stories of classroom life were similarly wholesome. They were translated into Japanese and Russian as well as German and Dutch, and were very popular in the US. Dora started life in the city, the daughter of a London insurance agent, Arthur Shafe, whose wife, Grace, carried on his business while he was in France with the Royal Horse Artillery during the first world war. It was only when Grace had to undergo surgery and was advised to leave the smoke of the capital that the family moved to the country. Encouraged by her parents, the young Dora was able to read before she went to the village school in Chelsfield, near Orpington in Kent, at the age of four. She knew all the Beatrix Potter stories and was immediately sent into a higher grade. Though she was poor at arithmetic, she shone at essays. Later she followed her elder sister to Bromley county school, and her love of language was stimulated by regular visits to the Aldwych farces, musicals and Shakespeare. However, school remained her ideal world, her memories from Chelsfield being possibly rose-tinted but endearingly appreciative. She made her two fictional villages, Fairacre and Thrush Green, more real than reality, allowing scope for a degree of wry humour. Her father turned to teaching, and so did she. Once she had completed her training at Homerton College, Cambridge, she taught in Middlesex from 1933 until 1940, the year of her marriage to Douglas Saint. After the war, she did occasional work as a supply teacher, and started writing on school and country matters for a variety of magazines including Punch and the Times Educational Supplement. She also wrote scripts for the BBC schools service. 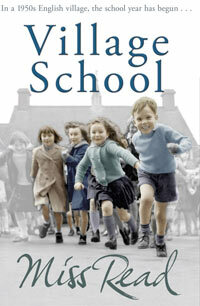 The first of the Fairacre novels, Village School, appeared in 1955; Thrush Green, the first of the new series, in 1959; and the last Fairacre, A Peaceful Retirement, in 1996. In two books of autobiography, Time Remembered and A Fortunate Grandchild, the main themes were a happy home and a happy school. They were brought together as Early Days (1995), which has since become one of a number of reprints by Orion. 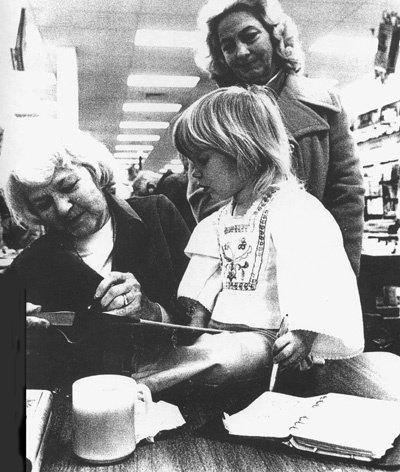 Saint also produced some books for children, as well as Miss Read's Country Cooking (1969). In 1998 Saint was appointed MBE. She and Douglas lived in Berkshire – in a small village, naturally. He died in 2004. She is survived by their daughter, Jill. Jenny Dereham writes: When the publisher Michael Joseph's autumn books began to appear – Miss Read's were always published on the first Thursday in September, and stayed in the Sunday Times bestseller list for five or six weeks – I came to appreciate what a following she had. As Anthea Joseph's editorial assistant, I found that very little needed to be done to any of her typescripts. After all, Dora had been an English teacher. After Anthea's death in 1981, I had the honour of becoming Miss Read's publisher, and graduated from a somewhat gauche copy-editor to friend. But I nearly blew it. To fit in with the company accountants' plan, I wrote to Dora suggesting that she write alternate Fairacre and Thrush Green books for the next five years, and please could we have the typescript as early in the year as possible. Dora sent me such a nice letter saying that she didn't really write to order and, actually, she thought she might write a short autobiographical work next – and so she did. Miss Read was an uncomplicated person. She wrote wonderfully about the things she held dear; good friendships, the countryside through the seasons and a bit of harmless tittle-tattle on the green. She did not shirk from speaking about the downs as well as the ups of village life. She wove the threat of school closure into her books with true feeling, and the unwelcome encroachment of new houses and incomers – but good always prevailed. One of her Thrush Green characters, Ella Bembridge, "was a great admirer of Anthony Trollope, partly because she was impressed with the industry and perseverance of the man". 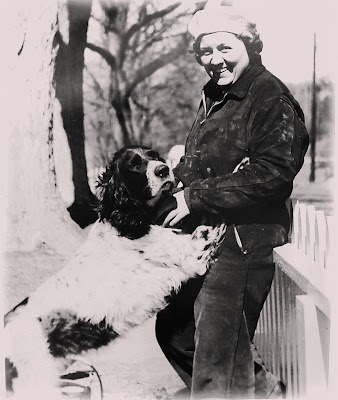 Ella also prized loyalty and doggedness: these were all qualities displayed by the writer. Although nearly blind for the last years of her life, Dora was always fully alert to the weather. 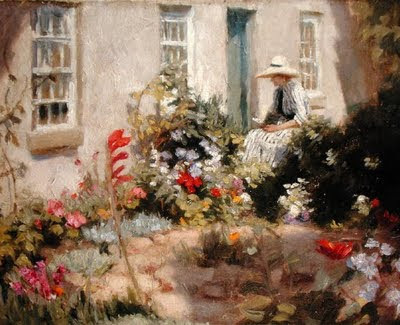 The pace of life might have changed in her fictional villages as the years passed, but the joy of a hint of warmth early in the year, as in Winter in Thrush Green (1961), never alters: "It was one of those clear, mild days which come occasionally in mid-winter and lift the spirits with their hint of coming springtime. Catkins were already fluttering on the nut hedge behind Albert's house and the sky was a pale translucent blue, as tender as a thrush's egg-shell." You may read online tributes, and leave one of your own, if desired here. 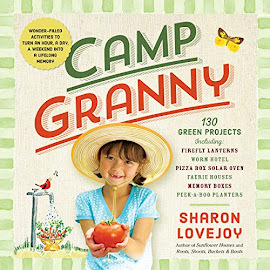 This is the first ebook borrowed from my state's digital library. It is very exciting to be able to do this. I chose it because of my love for Iceland which came about from reading all those Arnaldur Indridason books (if you want to read my book reports, click on the authors tab and scroll down to his name). 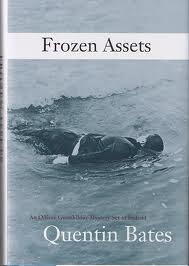 Frozen Assets is set during the financial crisis in 2008. It is quite different from Arnaldur's books. His detective and his stories seem more timeless - not so rooted in current affairs. There is a book which deals with immigrants to Iceland, but no mention of the economic situation that I recall. There's an interview with author Quentin Bates here, and an in-depth review here. The author's website is here where he describes the story of his Icelandic nickname. And that's just about it in a nutshell. I will continue to read because of the policewoman Gunna. Though her age was once noted at 36, she seemed older to me. Having just watched Lilyhammer on Netflix Instant, the actress who played Laila, Anne Krigsvoll was in my head. She seemed quite like Gunna, only older. I will also continue reading because of the setting. I'll probably never get to Iceland, but it is so interesting for me to read about it. I am looking forward to seeing Gunna's relationship with her daughter as time goes on; and a possible love interest in her life, as well as a new job. I really liked the book. As soon as I finished, I put my name on the waiting list for Cold Comfort, the second in the series. 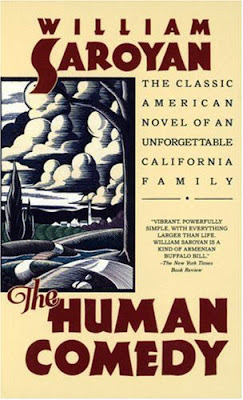 If you don't know about William Saroyan, you may read about him here. And there's a very interesting connection between him, his cousin Ross Bagdasarian, and Rosemary Clooney here. I must have been in my early teens when I first read this very special book, and saw the excellent film version with Mickey Rooney and Van Johnson. I think this fictional 'Ithaca,' likely based on real places in California's San Joaquin Valley during the 1940s, was like an Eden. A four-year old could walk around town, which was probably a small city, on his own. All boys were free to wander. When they were getting up to mischief like stealing apricots off Mr. Henderson's tree, the owner already knew the routine. He'd let them climb around a bit, and then would make his appearance on the porch and they would run off. A fourteen year old could do a responsible adult job like delivering telegrams, even to mothers whose sons had been killed in the war. Life happened in the town, not on the outskirts. So different from these days when so many businesses sprawl away from a town center. A boy could ride a bike without a helmet, and could carry two others, one on the back and one on the handlebars, and no adult said anything. You see where I'm going with this. There was real freedom for children, which wasn't without its possible dangers (falling out of a tree or crashing a bike). Nothing was organized. The kids, just boys in this story, decided on the spur of the moment what to do next. There were many nationalities in this place, and they are described as all being Americans. William Saroyan was very good at being inside a child's head. There is a society dedicated to this fine author. 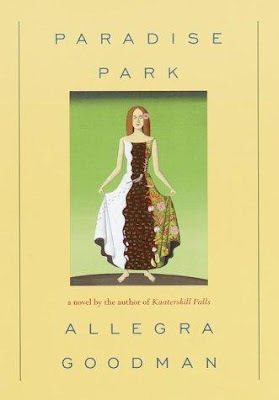 Before this, I'd read only one book by Allegra Goodman, and it is one of my favorites - Kaaterskill Falls. I have read it probably three times, all on unabridged audio, and a couple years ago I bought a used copy of the print edition. I hope to read it again as this summer begins. Paradise Park could be a record of what life was like for a lot of young people in the 1970s. It is not my story, but it is a real story for many, many people who were in their twenties during those years. Sharon's travels, both literal and spiritual are true. She is sensitive, optimistic, exasperating, and loveable. 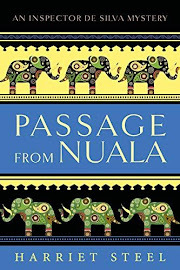 The name of the book is taken from a place she visits in Hawaii, a sort of aviary where birds never need fear predators or starvation, but where there is a ceiling, an end to their flight. Is it really paradise when everything is controlled? Is safety equal to freedom? This is a wonderful book which I loved. I could identify with Sharon even when she did things I had not done, and which I never would do. I'm just not that kind of person. But her spirit, her indomitable spirit raises her far above any questionable activities. She's a great character. I particularly loved the last section, and the ending of this book. There's a review here, and the author's website is here. If your volume is up, you'll hear the little lamp switch on. I love things like that. I look forward to reading everything Allegra Goodman has written. The author has titled each chapter with a name, a place, a date which ranges from 1937 Berlin to 2005 Illinois. We begin in modern day Illinois, and shift all around. Though there are many interconnected characters, it isn't difficult to keep track of them because of Deby Eisenberg's great device of chapter names. More writers should do this. I can't praise Pictures of the Past highly enough. It is romantic and informational with a great sense of many places, and characters that seemed very real to me. Lovely, lovely book. I'll not say more so you may discover this excellent story on your own. You may visit the author's website here. This name came from the herb moss pink, or wild ground phlox, which is one of the earliest widespread flowers of the spring. The pink moon, according to Chinese tradition, is the bearer of doom.﻿ In Chinese, and other cultures, a pink moon, or blood moon, is caused by a lunar eclipse and is a harbinger of a coming catastrophe. And here is Nick Drake's Pink Moon. It is impossible for me to imagine that dear boy being almost 64. He's been gone so long. Pink, pink, pink, pink, pink moon. A pink, pink, pink, pink, pink moon. Yeah, it's a pink moon. Addendum: I actually offered a blog entry of this song five years ago, also on the occasion of April's pink moon, but those were the days when the music I posted came from blog radio. It is now defunct and none of the songs from them on my blog work anymore. Now we have the wonderful you tube with pictures or live performances of music - such an improvement. Because of this, I felt it was okay to repost his beautiful song. I cannot believe that I've never heard of Ann Swinfen; I, who collect author names and book titles like others collect milk glass or stamps. 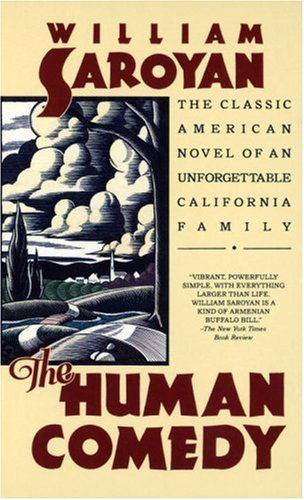 I was wondering the other day who wrote the same sort of books as Rosamunde Pilcher, and her name and this book came up in a review on Goodreads. It was .99 on the Kindle, so I thought I could give it a try. The first reading was five hours long. I couldn't stop. I loved this story and the way it was told. It takes place over the course of one day, but includes memories from the past. The book begins with mention of a painting of St Martins, the family place. Do any of you have a painting of your house? I feel so fortunate because Tom's late step-father painted ours in 1994. He was an amateur painter, but I feel he captured it quite well. Those shutters are gone now. The right lilac by the terrace was dug up to make room for flowers, and the big storm hadn't yet happened which took part of the old maple out front, and weakened the rest of it. Coincidentally, The Anniversary begins in 1994. St Martins is a community in the English countryside founded by the ninety-four year old matriarch of the family, Natasha and her late husband for artists of all kinds, refugees, and their own family. Some people stayed for a while, and others for a lifetime. This day in the book is the 50th anniversary of the beginning of St Martins. Old friends will be coming back, the family will gather, and memories will be relived. This gathering includes people of all ages, which is one of the delights of the book. We see life through the eyes of the old, the middle-aged, the young, and children. 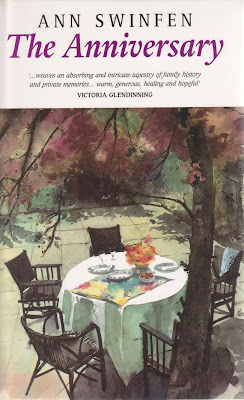 The comparison with Rosamunde Pilcher comes from the setting, the rich characterizations, the sense of family, and the descriptions. The big old kitchen at St Martins, with its range always hot, its large table and collection of unmatched chairs, had always been the general gathering place. The drawing room had been intended as the community's common room, but gradually had come to be used only for the monthly committee meetings. It was Natasha's domain, though anyone who wanted a quiet corner to read or think would gravitate towards it. The kitchen was the social centre. "When I was a girl in Russia, there were always pavilions in the gardens to shelter from the sun or the rain. So we had no need of such a thing as a marquee. But in your terrible English weather of June, nothing is certain." That leads into the next section about that very life in Russia. It is Petya's eighth birthday, and Mama and Papa have arranged a party. And then the reader learns of that particular day and time. This happens over and over. It increases our knowledge of the characters and their lives. 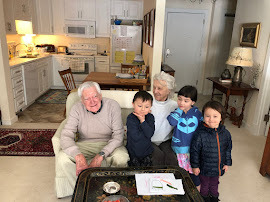 We learn of their experiences and their connections with one another over the years. The old become children, the middle-aged become young adults. I came to care greatly for many of these people. If you'd like to know more before picking up this book, you may read a synopsis on the author's webpage. I just loved it. It offered everything I could want in a book. In honor of her birthday! In this installment of the Jake Russo series, Jake is in New York City. This is where he was working as a newspaper reporter before the first book in the series. In that book, and in the ones that followed, we only met his editor Thompson via phone calls. Jake used to weigh a lot more than he does now, and used to eat a lot more junk food. Just about every time that editor has been in touch, he makes some kind of crack about Jake's weight or food choices. No matter how often Jake tells him of his new self, the editor does not believe him. He is a most irritating figure to me, and I cringe whenever Jake must deal with him. We all know people with a critical parent, and this man is that kind of person in Jake's life. And so, when Jake is ordered back to NYC to do a reporting job there, I knew he would be walking into an uncomfortable situation. Jake doesn't confront his boss. Instead, he is like the adult child coming home to that critical parent. He buckles under the mean scrutiny. I wanted him to yell out and say 'stop it.' 'I've lost the weight, I don't eat doughnuts anymore. Get off my case.' But he doesn't. He doesn't stand up for himself. He's in his old familiar surroundings, without Melissa, his girlfriend who is supportive and encouraging. He's like a little boy. I have a picture in my mind of his shoulders slumped and head slightly bowed down under all this verbal abuse. When Thompson first sees Jake, he says he doesn't believe it. Jake felt the nerves loosen. The teasing he'd suffered for years - it was finally over. No more fat jokes. No more criticism. No more abuse. But Thompson now finds other ways to taunt Jake. "Now Russo, I'm going to put a sugar in my coffee. I hope a health nut like…like you doesn't mind." "Sir, I'm not a health nut." "Ha! You're right. Nuts are too fatty! A health freak like you would hate that." The boss also gets under his skin in another way. Years ago Jake was obsessed with graphic novels. "I spent hours reading them and writing about them online. … I spent all day and all night obsessed with them. I didn't have a life. They're the reason I put on the weight. … I was a high-ranking officer in the fan club. I went to three conventions a year and was an editor of the newsletter. I even owned a replica costume for the main character." 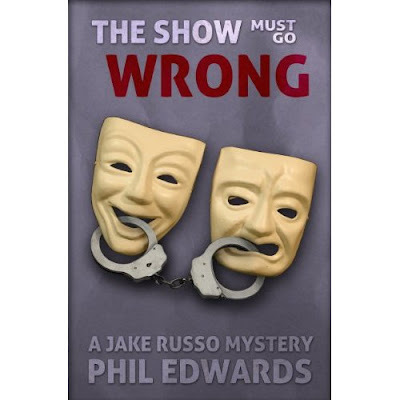 Jake is afraid that his new assignment, which is to report on a graphic novel being made into a play, will cause him to backslide, to fall into his old ways. Of course there is soon a murder at play rehearsal, and Jake and his food-blogger/photographer friend Gary are on the spot and begin investigations of their own. This fourth book was more serious in a way because of Jake's fears, the meanness of his boss, and the distance from his life with Melissa which offers security and strength to him. I wondered if he would succumb to the old temptations. I love the series and the characters, and look forward to the next one. Maybe Jake will get a new job!